Early Fall is the the setting for Splendid Isolation. 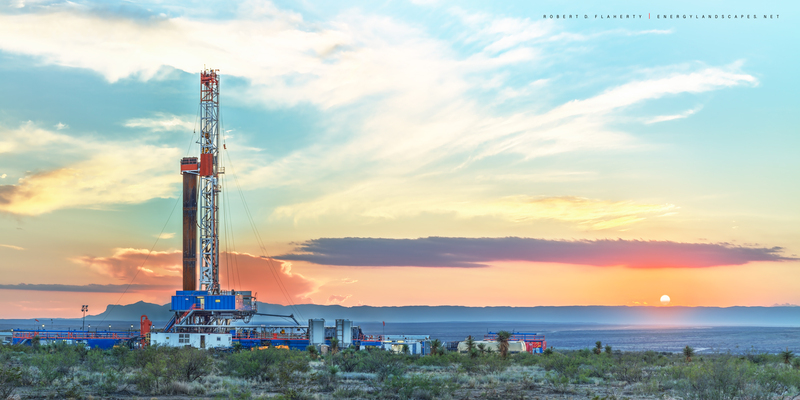 The image is a 2:1 high resolution panorama featuring a Chevron pad drilling operation spread out before the mountains of Guadalupe Pass in Western Texas. The location straddles the Texas/New Mexico border Northwest of Orla Texas. The panorama is composited from 63 high resolution images. The finished image is suitable for an extremely detailed fine art mural 12x24 feet. Fine art prints are available from 12x24" to 40x80".